The 1990 is the Chevrolet Beretta and the badge measures 1 3/4" x 1 1/3". In honor of the 75th Anniversary of the Speedway, Tony Hulman’s likeness again appears on the badge along with the Dodge and Chrysler logos as the Dodge Viper was the pace car for 1991. The badge measures 7/8" x 1 1/2". For 1992 the Cadillac Allante was pace car. The '92 badge comes in at 1 1/2" x 1 1/3". For 1993 The Chevrolet Camaro was again chosen as the pace car. The badge measures 1 2/5" x 1 2/5". 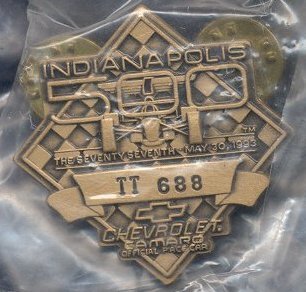 The 1993 badge is the ONLY YEAR where the bronze and silver badges differed. Because more room was needed for the letter and number on bronze badges it is above the Chevrolet logo and below on the silver. The 1994 badge is the Ford Mustang and it measures 1 " x 1 1/2". The pin holders on the back change from the smaller type to a tie-tack type holder. 1995 is once again the Chevrolet Corvette and the '95 comes in at 1 2/5" x 1 2/5". The 1996 badge is again the Dodge Viper and it measures 1 1/2" x 3/4". The Oldsmobile Aurora was the pace car for 1997 and the badge comes in at 1 2/5" x 1 1/2". 1998 saw the Chevrolet Corvette chosen for the second time in four years to pace the field. The '98 comes in at 1 1/2" x 1 1/2". 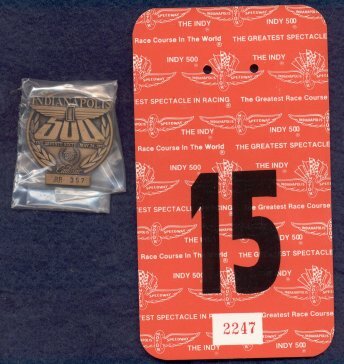 In 1999, the Speedway ended the eighteen year run of pace car badges and issued a fairly close reproduction of the 1953 badge which was a representation of a Cromwell helmet of the 1950's. The badge measures 1 1/8" x 1 1/2". 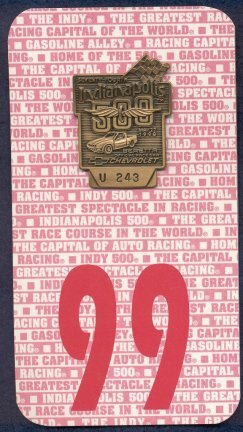 The Speedway continued to produce a lot of badges in the1990's so they are all fairly easy to obtain.